Hey all! We're back with more holiday cheer today! We have some mischievous elves in this line! I would love to use this line for our Elf on the Shelf pics! And Elf Magic is our 3rd line with new Misc Me items! 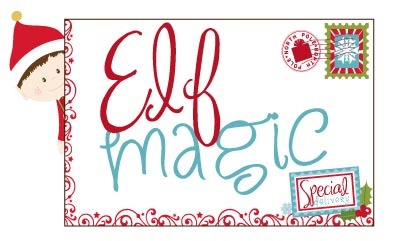 Leave us a comment for a chance to WIN some Elf Magic goodies! Then check back on Tuesday to see if you've won! OMYGOODNESS!! This is ADORABLE!! I sooooooooo want to use this collection on my Dec. Daily this year!!! Wow this is GREAT! What a fantastic collection for a December Daily this year. My kids still have Elf on the Shelf too (my oldest is 12 but he plays along) and the bright colors are so well suited to the purpose. The Misc Me items are of course my favorites. Oh wow! Love the new papers and can't wait to get my hands on it! Absolutely LOVE the Christmas collection. Can't wait to start using them. This is so cute!! 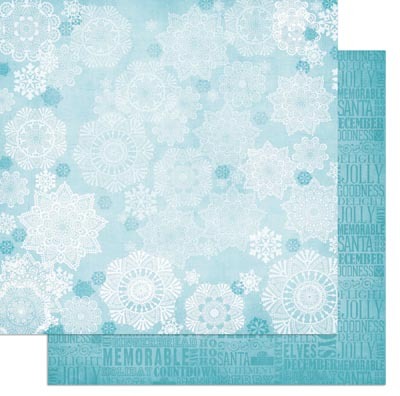 The snowflake paper is amazing! 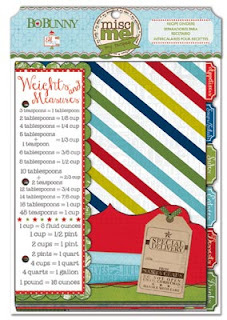 This is an adorable line and I love your idea of the Recipe Book. I think I might try this myself! I am in LOVE! 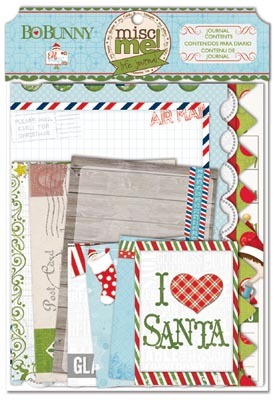 this collection is so fun and cute, i love the air mail paper and the embellishments are just fab! This is so adorable. I can see it used to make cards & LOs with cute little kids! Such an adorable collection. And the miscme notepapers! Waow! Просто великолепная коллекция для лета :)) Так уже хочется прохлады , зимы !!! ХОЧУ СНЕГА :)и эту волшебную рождественскую коллекцию !!! Those are the cutest elves I've seen in a long time!!! I love the dimensional stickers. so adorable and magical. This is definitely my favorite collection of the new release! 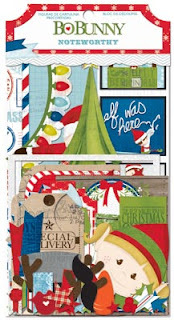 It is just too cute...love the elves, colors, and that airmail paper! This is one of the cutest Christmas lines ever!! I would love to win this for my Christmas pictures. Oh my goodness, that is the cutest line ever! It is definitely on my must have list! Absolutely Love It!!! That elf is so cute! I love the recipe book and journal. They would make perfect gifts! Love this line, the elves are adorable!! The 6" pad is fab!! Another home run of a collection BoBunny. Absolutely love it. Adorable! I especially love the notepaper and recipe cards! This line is adorable. 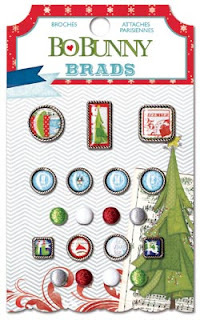 I can use it with the adults since it is simple and the embellishments kick it up a notch. such a cute playful line! So cute. Perfect for scrapping my grandson's first Christmas! How cute is that? Just love those elfs. OH WOW!!! I LOVE every single piece of it!!! Can't wait. Too cute. Love it! During the holidays I bake as well as my neighbors and then we swap goodies..very YUMMY! Would love to win this collection. I love the Elf collection. I've been looking for elf themed paper for several years. It's been impossible to find. Can't wait to get this. So cute!! This is going to fly off the shelves this holiday season! Just adorable. 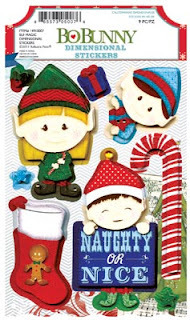 How cute...I love those little elves! fun bright papers for christmas! This is so adorable and whimsical! I love it! The elves are just too cute! I love the "fun" Christmas collections! It feels like choosing a favourite child.... But this one is absolutely my favourite release! Love love love the cute elves and the bright colours! 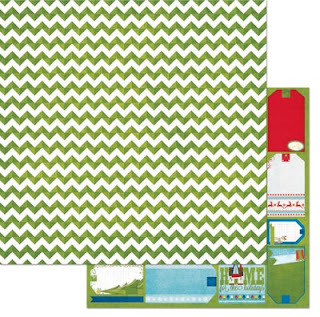 Must have two of each, and the adorable paper. With the elf bordered by the postal frame, how cute! I'm absolutely in love with this collection! Want it al!!! Oh wow - Oh my! This is just adorable! Those elves just make me happy for sure. Just love those elves. What a great idea to use with Elf on the Shelf pics. Can't wait till these little elves are sitting on my shelf! Love the colors. Love the cute elf. 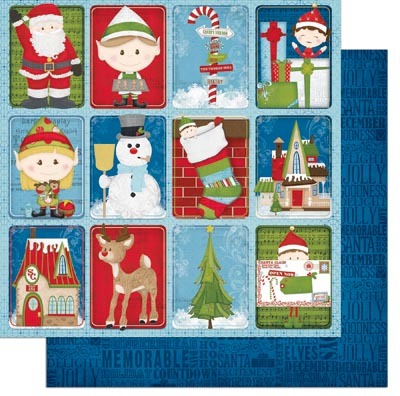 Oh wow, this is one of the most adorable Christmas collections I know. Absolutely fabulous! Has to be the cutest Christmas collection ever!! I need this!! We are starting elf on the shelf this year and this will be perfect! What a cute and fun collection! How cute is that elf! Those little elves are very adorable! They make me smile! Adorable Christmas collection! Love the elves! Oh my gosh those elves are too stinkin' cute!!!! 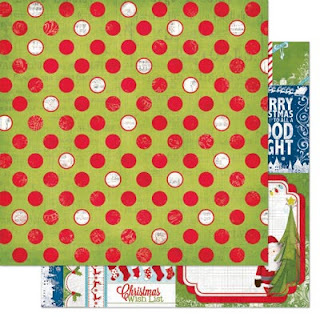 Love this Christmas collection!!! Way to go, Bo Bunny!!! Wow ! Beautiful! So cute collection ! Elf on a Shelf visited Bo Bunny and what fabulous results from that collaboration. This is your best holiday collection ever. Love the elves, the chipboards and that tree along with the wonderful paper designs. So many fun designs. This is a MUST HAVE! This line is so cute, I love the elves! Elf Magic is definitely Fun, Adorable and Cute! There are definitely some must haves in the summer collections! A fun little spin ( on my layout ) !!! 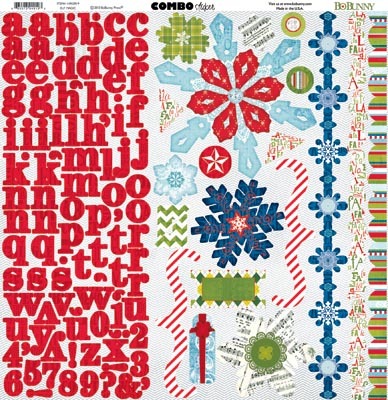 Oh my gosh - LOVE this paper! I think it will make a cute advent for my Grandkids! This line is adorable!! Love this Christmas collection!!! Love the Fa La paper! How adorable...I NEED this for my elf on a shelf photos! This is the best Christmas collection I've seen!! Love it all! Oh wow so whimsical and just adorable. Brings me back to my childhood and the memories of Christmas's past. Love it. Love it! This is my favorite of all your new collections. This line is SO much fun. 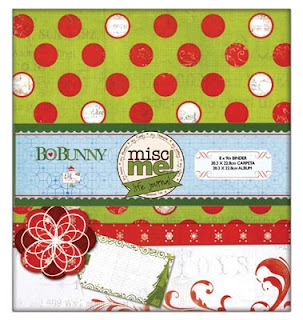 I especially love the new Misc Me.....and that has got me thinking about gifts. Thank you Bo Bunny! Wonderful Christmas collection. Love the colors and the papers. Thanks for the chance to win. It's hard to think about Christmas already but this cheerful collection sure puts me in a festive mood!!! Love this new Christmas collection. Wonderful colors and embellishments. What fun! 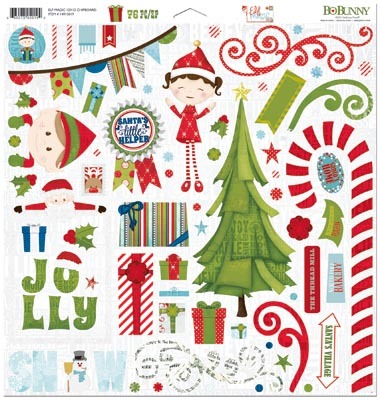 Perfect for kids Christmas pages! Oh I love the cute factor here and the colors are awesome!!! Perfect for my kids! Now this is one fabulous Christmas line. Love, love, love the elves! What a fun collection. I see a mini album in my future about our Elf Shelton. Cute name for the collection! I like the mini album - it would be great for December daily. Have been gone on vacation and just saw this once I got back on line. I must say this is CUTE! Love it!!! This is so cute! 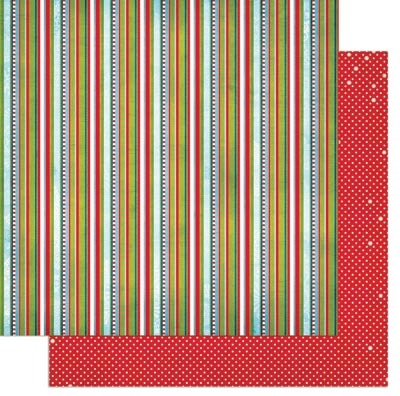 The colors are bright andn cheerful-the designs delightfully whimsical.I could definitely make some happy creations with this collection. I love this!! We love the Elf at our house! Those little elves are just SO CUTE! Super cute collection! This collection is so versatile and fun! Fun elves to play I can see! Thanks for the chance to win! What an adorable line! LOVE it!!! 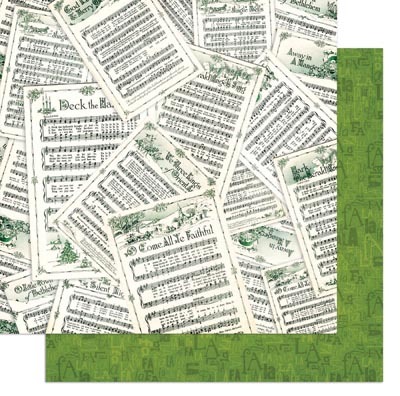 I'm especially fond of the song sheet and Fa La La papers! Thank you SO much for te chance to win some of this sweet Elf Magic! ADORABLE! I'm cooling off in this summer heat just looking at it! Love it! I love it! 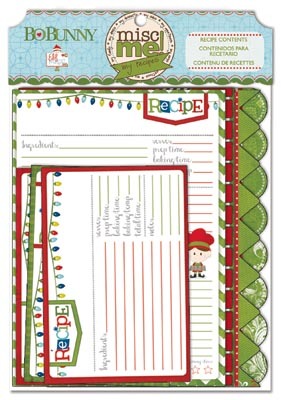 These elves are so cute - and it would be perfect for a holiday recipe book. Thanks! Those papers just scream Christmas cards to me. So festive, I love that! Very fun collection!!!. I love it!!! did anyone say DD this year??? I love this so much fun!!! There are so many cute elements in this collection! This is such a cute collection! Would make some sweet Christmas cards and LO's! 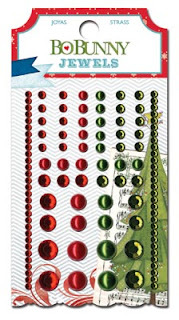 I see some very cute Christmas coming out of this line...it is a very fun looking line. Adorable! Love this color scheme and that elf is so cute! Such a cute line! Great colors and fun designs!! I agree with you, this line would be perfect for all of our Elf on the Shelf pics! I love the line, thanks for the chance to win! Beyond cute! I would love to play with this collection to do some Elf photos! Thanks for the chance! I love it all. You've hit all the notes of Christmas- the cool weather, the whimsy, the classic. Excellent job! oh my gosh I love this!!! this has to be my favorite of the new lines!!! This is such a fun collection. It reminds me of the Christmas cartoons they used to have on when I was a child. Great job! You always have great Christmas lines! The notepaper is so cute! I love the paper and the colors. It such a fun and I can not wait for Christmas now. Can not believe how cute and adorable the paper is. Love, love the colors and prints. My fav time of year. 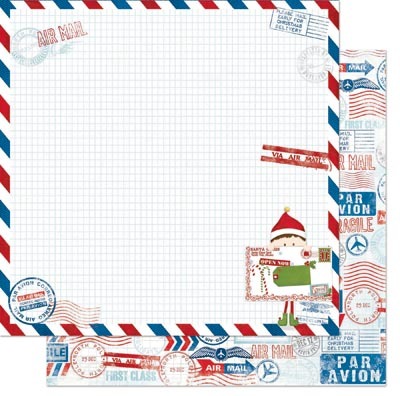 These are so cute and our cat is definitely an "elf" who at Christmas could be naughty or nice - so just the thing to scrapbook the mischief she gets up to in the Christmas Season. Seriously cute theme! Love it!! LOVE everything about this line!! The elf and snowman are my favs! OMGosh! What a sweet line. Love every bit of it!!! Aw, so cute! I still have pictures of our kids with a santa hat that need to be scrapped, this looks perfect for those piccies. Dear Santa: Could you please put some of this purtifulness in my stocking? Love this collection so much!! The elves are so adorable! This will be perfect for my December Daily this year! Love that color palette, those greens, red. light blue and darker blue are so awesome; Elves are too cute! 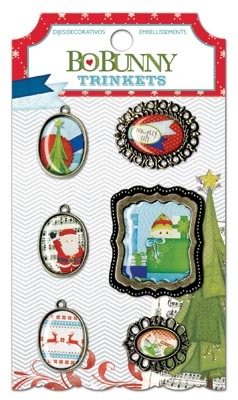 This is such a fun whimsical collection! Thanks for the chance to win! Now this is FUN! 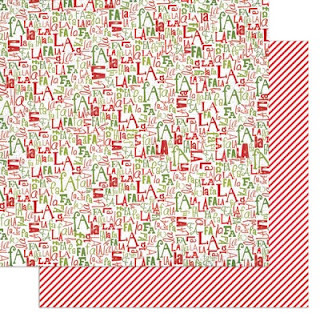 Bright, Christmasy colors and a bit of whimsy...I love it! What a great idea for the Elf on the Shelf. My granddaughters have that and it would be great fun to scrapbook their fun with that little guy. Would love to win! I love it!! Perfect for kids! LOVE IT! And Argyle? I about died when I saw that. Christmas cards, here I come!!!! I love the Elf Magic line. In our family we always make candy for Christmas. I will be getting the recipe cards and dividers to make gifts for some family members. I now have more reasons to look forward to Christmas! This is such a cute line!! I love the elves!! 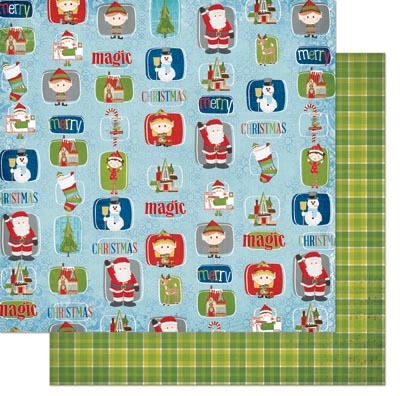 Ok - I've found my Christmas line for this year! My scrapbook pages, daily pages and cards will be made of this. It is my absolute favorite!! That elf is so cute! I love this line! Absolutely adorable! 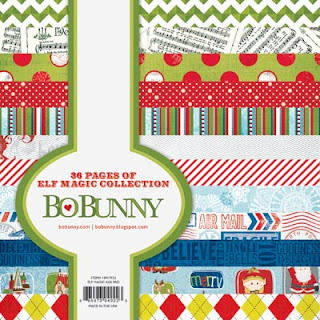 Love the fun colors and the elves are so cute! Really great!!!! I love every little piece of it!!! So adorable!!! I want it all! This is so adorably sweet! Lisa L.
OMG, just stunning. Can't wait to get my hands on these. Such a fun line! Love this collection! How do you continue to come out with the best lines? I love this line! We are starting the Elf on the Shelf tradition with my 1 year old daughter this year. How fun would this line be with all the cute elf pictures I plan to take? Elf Magic is so cute!!! Love this new collection!! Oh I can't wait to use this for my Elf on the Shelf pictures. So much fun! I knew I was waiting for the perfect paper and now you have come up with it. Awesome! OH MY I LOVE IT! The colors are awesome and all the extras are so cute! I LOVE this collection! My first thought was elf on the shelf. This line will be perfect. I can't wait to get it! This line is SOOOoooo cute! I'm absolutely going to get this one!!! Wow...this collection is totally darling! You've really outdone yourself this time, BB! OMG!!! These are adorable!!! We just started my granddaughter on The Elf on the Shelf this past Christmas and what a hit it was!!! this year will be even more fun cause she'll be 3 and understand it even more. 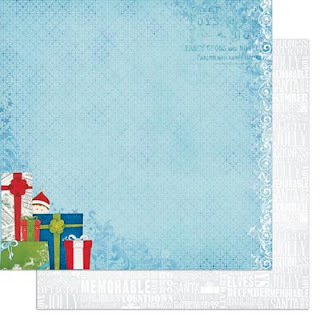 This collection would go so well with scrapping her Christmas pics. Oh my, I think I need to add this to my Pinterest "Elf on a Shelf" board. Cute!!! Time to make an album from all of our elf's antics from last year! This is great! Wow! So cool and for my favorite time of year! 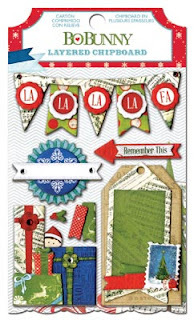 This collection is so sweet and just perfect for card making for my Elf on the Shelf fans for Christmas. This is just too cute! 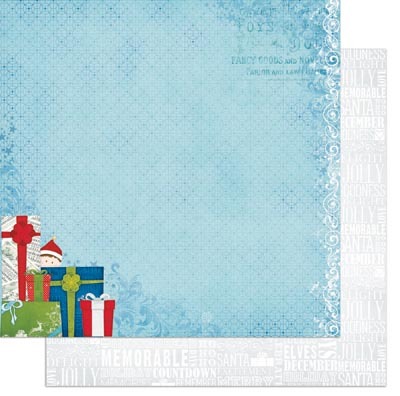 I am redoing my son's first year baby album (it was the sticky back page kind) and this collection would be perfect for his first Christmas pictures! That little Elf is soooo cute!! Love this line! How cute is this!!!!!!!!! I can making several layouts with it, a mini album for a teacher, oh the possibilities are endless with this line! LOVE IT! 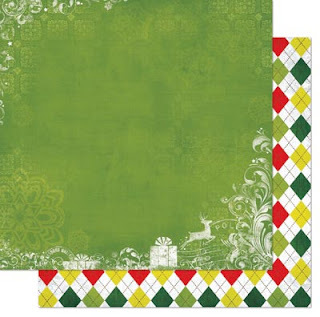 Oh my word n day, I really want this, I am willing to buy and I must have the 6x6 pad actually I need more than one of them. Heavy Sigh and they don't have them at my store pllllllease let me win or tell me where I can get them online. Thank you!!!! Adooooorable!!! Love, love, loooooove this collection!!! Love the elf! This is a great line. I love this paper line. 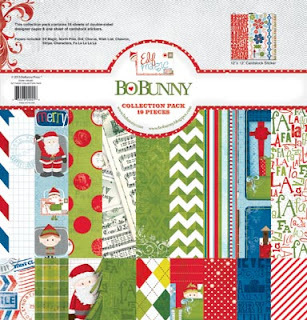 What a fantastic collection, I would love to use it with my Christmas layouts this year. so very cute and I totally love the Misc me things! Squeal! This looks like so much fun! I want to get an Elf on the Shelf this year and this paper would be perfect to scrap the pictures. I still have to scrap our Elf on the Shelf adventures from last year. This would be the perfect line!!!! Super cute, love the elf! This is just stinkin' cute!! Can't wait to do some holiday pages with this collection! I love it! It's soooo cute! I would love to use it in my December Daily album this year. I want it now! Love this new collection. I have had this little elf on my Christmas tree since I was a little girl. It reminds me of my childhood Christmases. Love this entire collection. Would be great for my yearly assignment to my family of two teenage boys and husband to pose the elf doing something fun. You never know what the elf will be doing next! Ohhhh my word!!!! This collection is absolutely AMAZING!!! I can NOT wait for it to hot the stores!! Yay!! This is my favourite christmas collection for the year - i can't wait to start my christmas cards with it! I REALLY REALLY just love this collection,can't wait to get my hands and scissors to it. The embellishments are so cute! I can't wait to own this. My first grandchild just turn one and I bought this for Christmas for him last year. I will make a book out of this collection and put pictures every year of him reading a trying to find the elf in it. I am really excited! This is perfect to document my granddaughter's Christmas adventure with her Elf! Great colors and design. This line is so adorable. I just love it and can't wait to get my hands on it. Oh My Geezers! I just want to bust out in ♫song♫ seeing all this gleeful goodness!! I definitely must have some of all of this line! I am so in love with the "Elf Magic". I always make Christmas Cards for my Grandchildren and this will be so much fun. I am so excited. 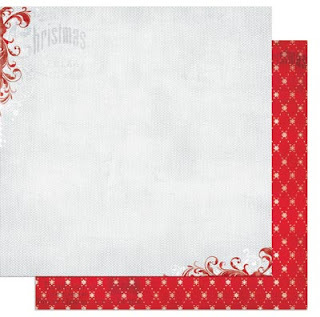 It is only August and I already know what paper I want to use for their cards! Sure hope I can win some Elf Magic!!! I really like this line. The colors are great to use with my guys and I am a sucker for anything Christmas ANYWAY, but this is special. I will hunt for it. Very bright and joyful collection! 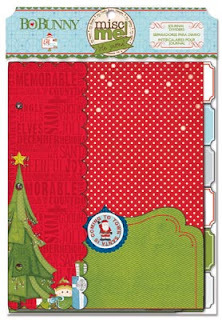 I really enjoyed using this for my Journal Your Christmas Album. Part 1 is now up on my blog and I hope to share more that album and the Merry Memories Album I also made with the Misc. Me Elf Magic collection as my core supplies. Love this collection .... went on a cruise for Christmas and am using this line to scrapbook the trip - has a slightly nautical travel feel to it which ties in great with the trip! !